I’ve been escaping to Ibiza all my life and I never tire of this beautiful and special place. It is the perfect destination if you want to relax but also if you have a sense of adventure and it seems to manage to conjure up magic whatever you are looking for. Fantastic for couples and families alike it is the one place that my children want to keep returning to. Ibiza is small but very diverse and the various areas all have very different vibes, so there is always somewhere to go that suits your mood. The main piece of advice I would give is to hire a car for at least part of your stay and get out and about exploring – it only takes at the most 90 mins to go from one end of the island to the other and most parts of the island are fairly accessible and all are unique and memorable. 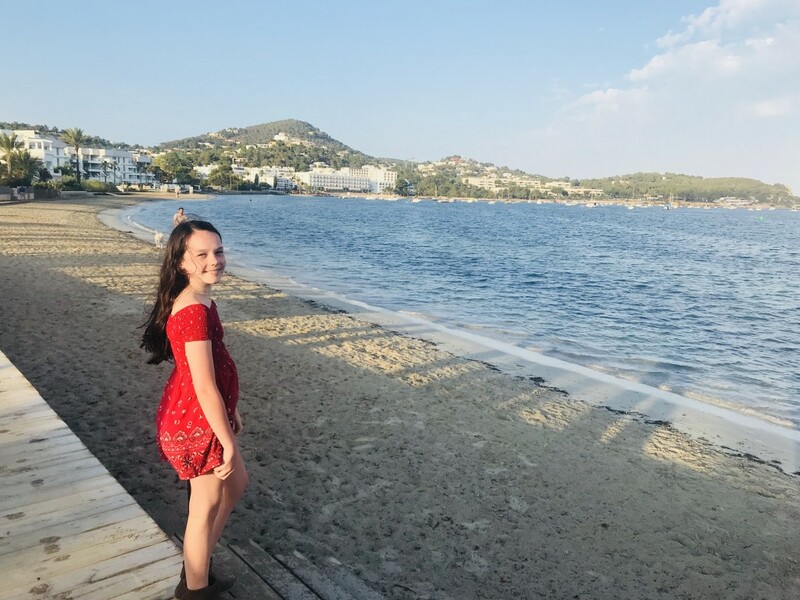 This trip we stayed at two of the new hotels in Ibiza which are more family friendly than other properties on the island and are also fantastic for couples for special occasions. 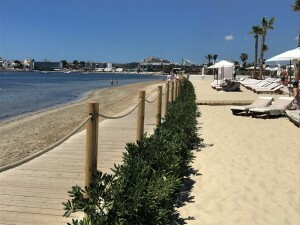 NOBU Hotel Ibiza Bay is in the South on the lovely Talamanca beach, only 5 minutes by taxi from Ibiza old town. This small but perfectly formed hotel is right on the beach and boasts a slick stylish design inspired by natural Ibizan materials. The beauty of this hotel is its location right on the beach but still close to all the action and its stunning pool area which is every bit as good in real life as it is in the photos. 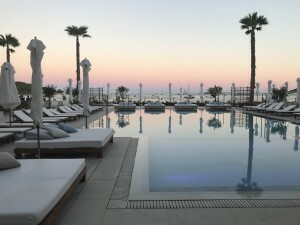 It is also close to the airport from which you can be collected in the hotel’s own fleet of blacked out Range Rovers. 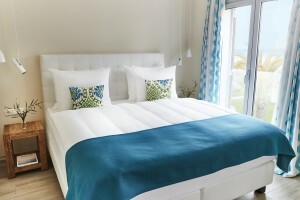 The hotel has designer chic rooms with ocean and bohemian influences thrown into the mix. 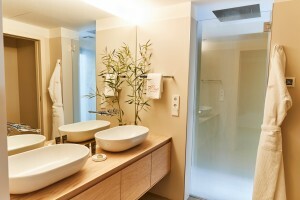 Deluxe Garden View rooms are quite compact and only have a shower in the bathroom so we would propose a Junior Suite and above if you want a bathtub and more space. We would definitely recommend walking along the beach to the marina and catching the boat across to the old town for a wander around day or night. It is a lovely and easy way to get to the old town with boats returning up until about midnight. The children loved it and it only costs a few euros return with boats coming around every 20 minutes or so. The Dalt Villa, a UNESCO World Heritage Site, is at the top of Ibiza Town and is an ancient walled fortress dating back to Roman times. It is a must see where you can explore the narrow, winding, steep cobbled streets and magnificent views from the breaks in the high ramparts and the vast terraces at each level (Dalt Vila actually means ‘Upper Town’). You access this part of the old town by walking up a massive ramp to a dramatic entrance, and entering into an ancient cobbled stone courtyard, leading immediately on to the Plaza de Vila (main square). This area is full of amazing restaurants and street entertainers but you must book the fine-dining restaurants ahead as it gets very popular. 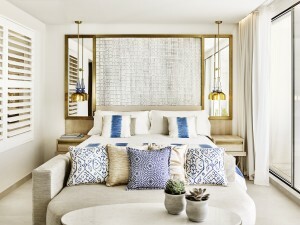 The hotel has many top-notch facilities although it is a small boutique property such as a Nobu restaurant, six senses spa, John Freida hair salon and kids’ club (almost unheard of in five star hotels in Ibiza). It also has a trendy bar overlooking the infinity bar which plays low-level DJ music and is a cool place to enjoy a sundowner. You can also walk out of the hotel along the promenade to handful of local restaurants and bars serving tapas. 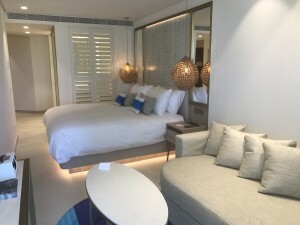 The next hotel we visited is the new 7Pines resort in the West of the island. 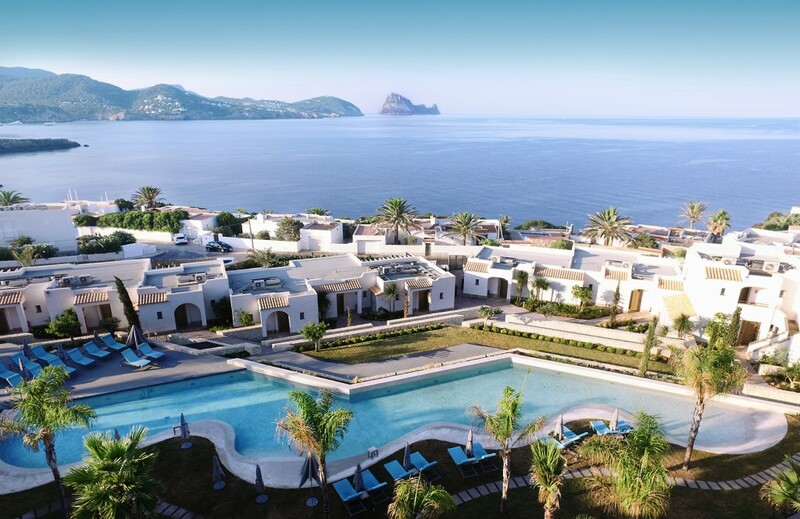 It is a large full-service resort with an absolutely stunning vantage point overlooking the ocean and the mystical rock island of Es Vedra from a clifftop location. It makes for some absolutely jaw-dropping panoramic ocean views. 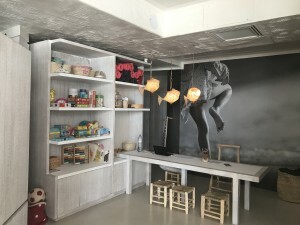 There is no Kids’ Club at this resort but there is plenty of space and it professes to be very child friendly with a concierge equipped with a long list of family friendly things to do nearby. There is a Laguna pool area which we thought was perfect for families and then also an aquarium pool with a transparent end maybe more suitable for adults. Only 200m away you will find the charming cove and beach Cala Codalar, here there is a lovely (if a bit pricey) little chiringuita serving drinks and great food. 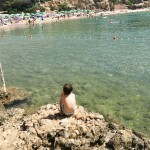 Tip: Cala Codalar is a sand and cobble beach so beach shoes are essential! 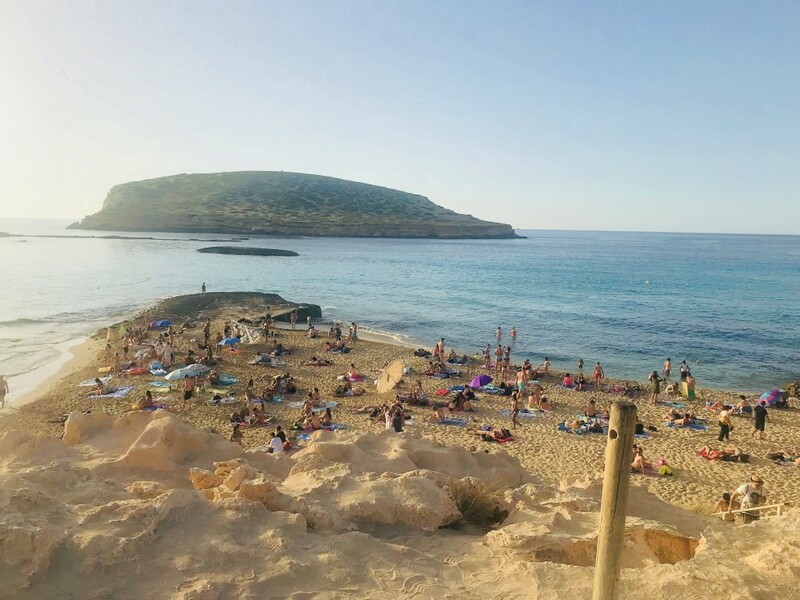 Alternatively, the well known and larger Cala Conta beach is only minutes away where the beach restaurants play music to the sunset and is well worth a visit! We really recommend venturing out by car and discovering the beaches for which Ibiza is so famous. 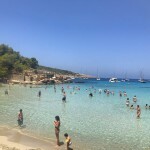 Beach hopping in Ibiza is simply one of the most delightful things to do and each beach is different and varied in equal degrees from tiny little rocky coves to vast stretches of golden sands. Spend the day snorkelling, sunbathing and exploring and finding lovely little beach huts for lunch, every day will be different and wonderful. Tip: Most of Ibiza’s beaches are signposted (brown signs with a parasol) but many have “challenging” parking arrangements and some involve a lengthy walk, but if you just take your time the extra effort is always worth it. Tip: Only a few minutes away by car is the beach restaurant Sunset Ashram which is famous for its sunset drinks, if you want a table and something to eat pre-booking is absolutely essential, it books out months in advance. If trinket shopping is for you then definitely enjoy a day at the Las Dalias markets, which is just outside of the charming village of San Carlos in the North. These open-air markets have dozens of stalls selling local artisan crafts, a real treasure trove of hippie chic clothes, accessories, food and interiors pieces, whilst not cheap they are very unique and browsing will keep you occupied for hours. It’s the perfect place to find bohemian kids clothes, jewellery and local natural face creams and bath products. There’s also food and live music on offer. Santa Gertrudis is a beautiful little town in the middle of the island with great shops and places to eat and drink coffee around a lovely little square and ancient church. The village is full of charming little shops selling beachy coverups, clothes and homewares. We inevitably spend a day or two here on our children’s insistence and manage to while away the hours buying lots of items to take home and enjoying the wonderful food and relaxed atmosphere. 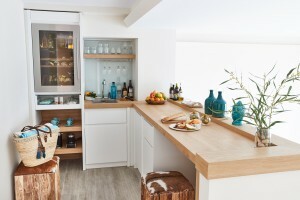 La Brasia in Ibiza town (strictly reservations only) – original and romantic (but always very, very busy) in a floral-canopied courtyard with classic Spanish fare. The Giri Café in Sant Joan de Labritja in the North – don’t be fooled by the unassuming exterior – inside is super trendy with great service and amazing for celeb spotting too! Tip: Everything happens later rather than sooner in Ibiza and most people dine out late; restaurants open at about 8-9pm and many people don’t even start their meal much before 10-11pm. Our advice would be to acclimatise to “Ibiza time” as quickly as possible! Young children (and adults if you like!) should be having siestas by day two so they can eat later. 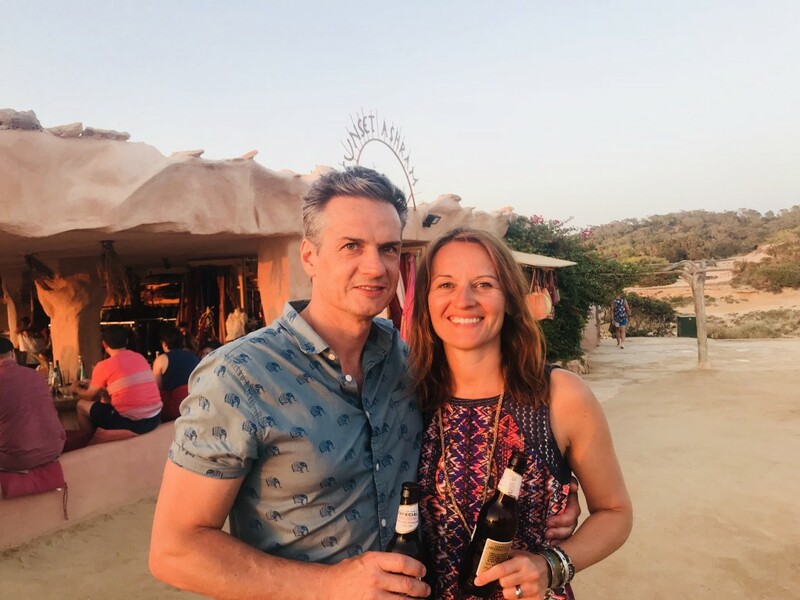 Also, Ibizians are extremely proud of their restaurants and many have been run by the same family for generations, therefore food and service can be a little erratic but charming – we would recommend that you go with the flow and enjoy the moment. 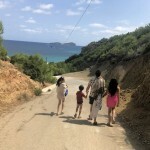 The most fantastic days I have had in Ibiza are those where we have toured around as a family and just stopped somewhere that piqued our interest. It is best not to schedule too rigidly, some days you might start with a plan to go to beach only to stop off in a village on the way and end up spending the whole day eating lunch there! 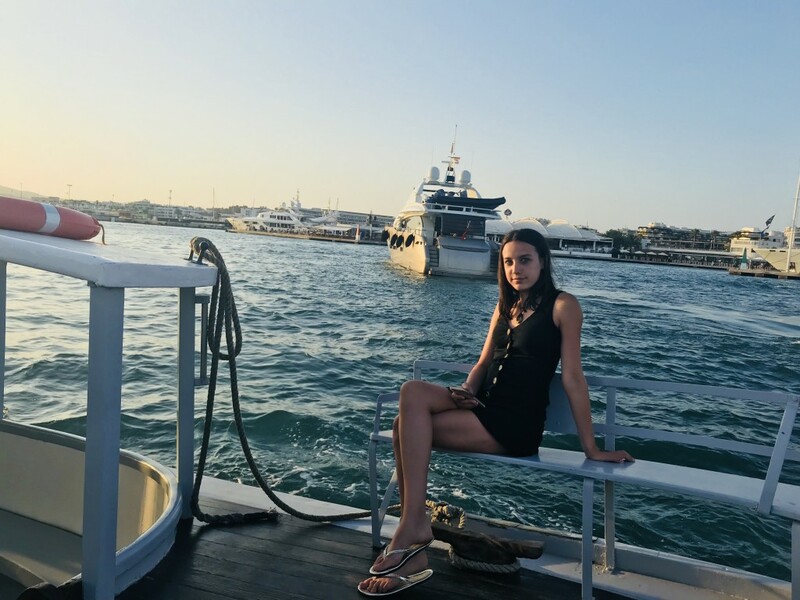 If you want top-notch luxury and glamour with stunning five-star restaurants Ibiza will not disappoint, but if you would prefer to find a random little barefoot beach club with best fish you have ever tasted you will find this as well. 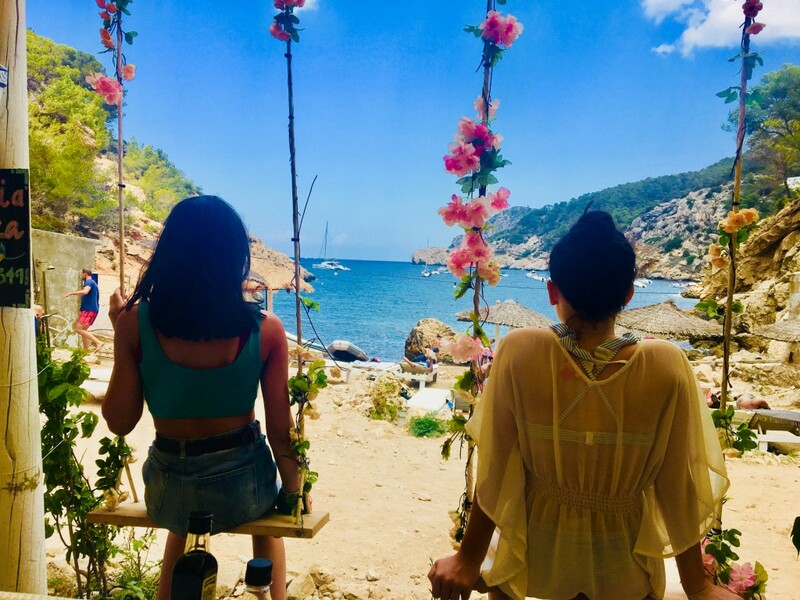 Ibiza can be extremely expensive but it doesn’t have to be, we would recommend that you experience some of the new luxury and some of the original old Ibiza. 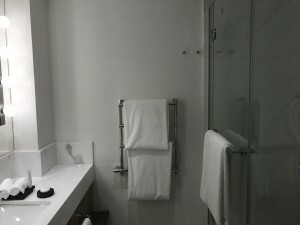 If you combine a stay at these two hotels with some days out shopping and other days relaxing on the beaches and then throw in a few sunset bars and evenings out at restaurants you will have the time of your life.